Saturday, July 20, 2019 will mark 50 years since Neil Armstrong & Edwin "Buzz" Aldrin, with the help of Michael Collins, became the first humans to set foot on the moon. In the 50 years since then, 6 more missions have sent men into lunar orbit, but none since 1972, when Eugene Cernan & Harrison Schmitt set foot as part of Apollo 17. Apollo 11 is a documentary unlike any I've seen before in my entire life. The film follows the lead-up, the mission, & the aftermath of Apollo 11, the first manned mission to the Moon. Neil Armstrong, the commander, will be the first man to walk on the Moon. Edwin "Buzz" Aldrin, the lunar module pilot, will follow as the second. Michael Collins, the command module pilot, will keep the command module, Columbia, in the Moon's orbit while Armstrong & Aldrin step foot on the surface of the Moon. On July 16, 1969, Apollo 11 launched from Kennedy Space Center in Merritt Island, Florida. They eventually separated from Saturn V in orbit, & four days later, on July 20, 1969, entered the Moon's orbit. They landed in the Sea of Tranquility not long after. Eventually, Armstrong becomes the first man to step foot on the Moon, "one small step for man, one giant leap for mankind." Aldrin follows soon after, & they spend 21.5 hours on the lunar surface before rejoining with Collins, leaving lunar orbit, & returning to Earth on July 24, 1969. Todd Douglas Miller's direction is phenomenal. Miller focuses the film in a fly-on-the-wall manner, unlike any other documentary I've seen. There are no interviews with any of the people involved, & there is no narration besides the voices of news anchors covering the mission. This allows for the audience to see the film in a very matter-of-fact way, which works to the film's advantage, as it gives the audience a sense of wonder although we already know how the events unfolded before we walk into the theater. This is an absolutely exemplary documentary. It goes very in-depth into one of the greatest achievements in human history, & makes us feel as awe-inspired as those who witnessed it on that summer day 50 years ago. 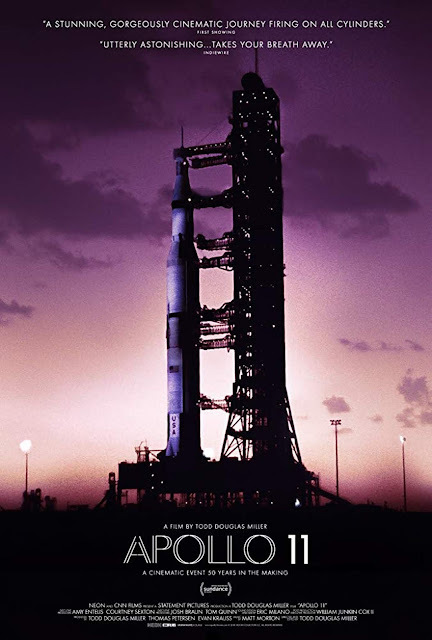 Apollo 11 was seen by me at the MJR Troy Grand Digital Cinema 16 in Troy, MI on Friday, March 15, 2019. It is currently in 8 theaters in the Detroit area, including the MJR Troy Grand Digital Cinema 16 in Troy, MI; The Maple Theater in Bloomfield Township, MI; the MJR Brighton Towne Square Digital Cinema 20 in Brighton, MI; & the Goodrich Quality 16 in Ann Arbor, MI. Its runtime is 93 minutes, & it is rated G.